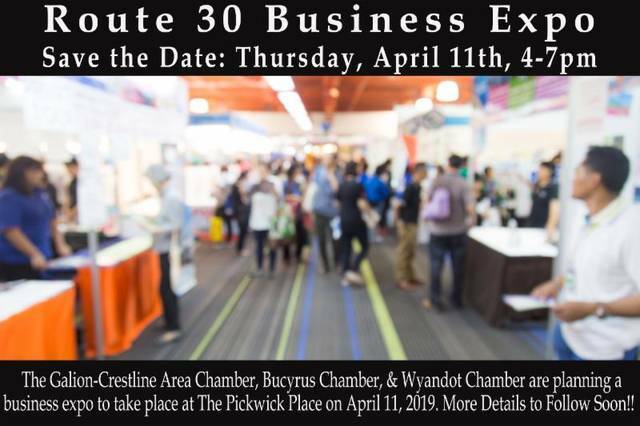 BUCYRUS — Reserve your booth today for the Route 30 Business Expo, which is April 18 from 4-7 p.m. at Pickwick Place, 1875 N. Sandusky Ave., in Bucyrus. Electricity and wifi included with rental space. Appetizers and beverages will be provided. Exhibitors registration includes listing on an exhibitor’s map, Vendor List with Contact Information. Exhibitors receive 8-foot space with pre-set 8-foot tables and two chairs. Bring your own linen. The cost is $175. Register online at www.wyandotchamber.com/expo Registration will not be finalized until payment is received and please specify your requirements in advance. Availability is limited. Exhibitors must bring their own extension cords and power strips. GALION — From Citizen to Patriot’s next free public forum is at 6:30 p.m. Thursday, Feb. 21 at Galion Pizza Hut, 820 Harding Way West. Doors open at 5:30 p.m. for an optional social hour. There will be a birthday tribute to George Washington and Abraham Lincoln, and a presentation on the Council of Foreign Relations. For more nformation, call Carol at 419-468-2944 or Jim at 419-468-5116. BUCYRUS — The next monthly meeting of the Crawford County Council on Aging, Inc. Board of Trustees is Wednesday, Feb. 20, at 10 a.m. at the Crawford County Council on Aging Office at 200 S. Spring Street, Bucyrus, OH. Call 419-562-3050 for more information. LUCAS — The Malabar Farm Foundation is hosting its annual “Big House Valentine’s Bash” featuring “Just Jazz Live” performing the great American standards. Tours of the Big House, a five-course meal, humorous characters, and parting gifts are offered during four seatings: Thursday, Feb. 14 at 6 p.m.; Friday, Feb. 15 at 6 p.m.; Saturday, Feb. 16 at either 4 p.m. or 7 p.m. Tickets are $50 per person and early registration is required by calling Victoria Cochran at 419-892-2929. For more information check out Malabarfarm.org/events. IBERIA — Spring semester registration at Ohio Central Bible College is Feb. 26 All adults with a high school diploma or a GED can enroll in spring semester classes. Classes offered include “New Testament Survey” with Professor Jack Moore of Mario); “Church History” with Prof. Rhett Crabtree of Green Camp; and “Christian and Community Service” with Dennis Schultz of Mount Gilead. Registration is Tuesday, Feb. 26 from 6 to 9 p.m. at Iberia Presbyterian Church. The first day of class is March 2. Call -419-946-5576 for more information or visit www.ohiocentralbiblecollege.org. CRESTLINE — Leesville Grange 2078 met Feb. 5 at the Jefferson Township Fire Department on Feb. 5. The charter was draped for Rev. Millard Mead who died recently. The group decided to give a memorial in his memory to the Ohio State Grange Foundation. The Legislative report was a discussion on House Bill 625 Authorize and regulate use of reusable containers to eliminate the use of plastic bags Margaret Ann Ruhl is new Ohio State Grange Legislative Director. The Deaf Activities conference is at the Ohio State office on March 23. Members are asked to bring items for the Crestline food pantry to the next meeting. The program was about “The Invention of Toilet Paper and Ever Popular Outhouse.” The next meeting is March 5 at 7 p.m. at the Jefferson Township Fire Department.